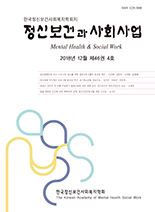 김성용,(2014).정신장애인의 스티그마가 자아존중감에 미치는 영향.정신보건과 사회사업,42(3),91-120. 전통이론에 따르면 정신장애인의 스티그마는 자아존중감에 부정적인 영향을 준다. 그러나 최근 연구결과들은 이러한 스티그마와 자존감의 부적 관계를 항상 지지하지는 않는다. 이러한 연구들은 스티그마와 자아존중감 간의 정적관계도 있을 수 있다는 것을 보여주면서, 이러한 현상을 스티그마에 대한 자기보호적 속성이라고 명명하였다. 하지만 정신장애인들도 스티그마에 대한 자기보호적 속성을 나타내는지에 대해서는 알려진 바가 없다. 본 연구는 이러한 스티그마에 대한 자기보호적 속성이 정신장애인들 사이에서도 나타나는지 살펴보고, 정신장애인의 스티그마가 자존감에 미치는 영향이 정신질환 원인 귀인 방식에 따라 차이가 있는지 검증하였다. 이를 위해 정신요양시설 입소자 1,742명을 대상으로 구조방정식 모형을 분석하였다. 분석 결과는 인구사회학적 변인과 임상적 특성 변인을 통제한 상태에서 (1) 스티그마 수준이 높을수록 자기비하 수준도 높아서 전통 스티그마 이론을 지지하였고, (2) 스티그마 수준이 높을수록 자기존중 수준도 높아서 스티그마에 대한 자기보호적 속성도 지지하였다. (3) 스티그마가 자기존중에 미치는 영향은 생활스트레스 귀인에 의해 매개되었고, 스티그마가 자기비하에 미치는 영향은 초자연적 귀인에 의해 매개되었다. 이러한 연구결과를 바탕으로 정신장애인의 스티그마 적응에 관련한 실천적 함의를 논의하였다. According to traditional stigma theories, stigma has effects on self-esteem with mental illness(MI). The results of recent studies, however, do not always support the negative relationship between stigma and self-esteem. Recent studies paradoxically showed positive relationships between stigma and self-esteem, which is called self-protective properties of stigma. However, very little is known about whether self-protective functions of stigma can be replicated among individuals with mental illness. This study aims to examine self-protective properties of stigma can be replicated among individuals with MI and examine whether the effects of stigma on self-esteem differ depending on causal attributions of MI. Structural equation modeling was done involving 1,742 individuals with MI residing in long-term care mental institutions. Controlling for socio-demographic and clinical characteristics, (1) individuals with higher levels of stigma presented higher levels of self-deprecation, supporting traditional stigma theory and (2) they also presented higher levels of self-worth, supporting the self-protective properties of stigma. (3) The effects of stigma on self-worth were mediated by attributions for stressful life events, whereas the effects of stigma on self-deprecation were mediated by attributions for supernatural causes. Based on these findings, practical implications for coping stigma among individual with MI are discussed.